The example is made with Red Heart Light and Lofty, a super bulky yarn. 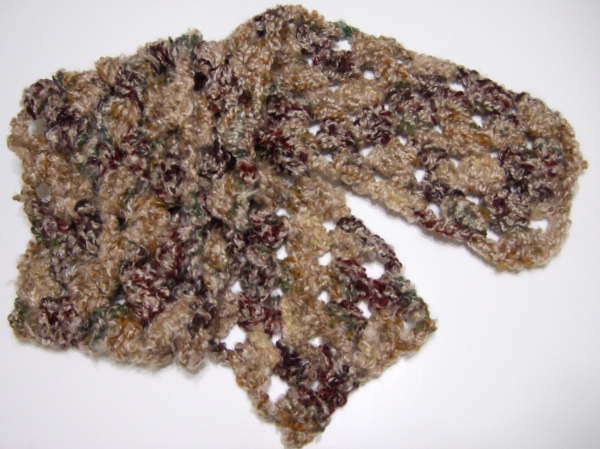 The scarf can be made with lighter weight yarns and smaller crochet hooks. You can add beginning chains in multiples of 3 to make the scarf the width you like. Chain 11. The scarf can be made wider by adding 3 chains for each block wider. Row 1: 3 dc in 5th chain from hook, (skip 2 ch, 3 dc in next chain) to end of chain. Row 2: Ch 4, turn. In each sp between 3 dc groups, make 3 dc across row to end. 3 dc in ch-4 sp. Repeat row 2 until scarf is desired length. Finish off and weave in end. Have tons of homespun from a weak moment during a Black Friday sale. Maybe I can finally use that yarn up. Thanks for sharing. Brenda, you made me laugh out loud as only another crafter would understand. I have an abundance of pretty yarns to make this pattern with, and I am starting on this pattern tonite. This is an excellent scarf pattern! I found it just in time for this extremely cold weather. Thank you for sharing it! I’ve been looking for something to do with this bulky yarn I have; I tried another project, but it was so hard to find the stitches that I bailed out. This was perfect for that yarn being that you crochet in the spaces. Made the scarf last night, and will be making another tonight. Thanks for sharing! I made this with regular worsted weight using I hook. Added six chains. Turned out gorgeous. Thanks for your comment Pat. I have some beautiful Caron Simply Soft yarn (4)worsted I’m going to try after reading your comment! I made this last night as a quick b-day present for a friend and it came out beautiful. I ended up making it a keyhole scarf though because it wasn’t quite long enough to wrap around the neck in a comfortable manner using only one skein. I don’t have the N/P 10 hook can I use a N 9 and it work out okay. Quick and easy, no hassle, love it.